The Robert E. Gard Foundation is dedicated to fostering healthy communities through arts-based development, it is currently seeking stories from communities in which the arts have improved the lives of citizens in remarkable ways. These stories can either be full descriptions (400-900 words) with photos, video, and web links or mini stories (ca. 200 words) with a photo and optional video or web links. Descriptions of submission criteria are given below. This will be an on-going project. There is no deadline. The arts spring from the commonplace and celebrate our essential humanity. Everyone should have the opportunity to participate in arts and cultural experiences. The arts have the power to ignite change. The arts are an essential part of building healthy communities and meaningful lives. The arts play a vital role in placemaking. REMINDER:The lessons of Robert Gard’s work apply equally to rural and to urban communities. The Foundation actively encourages submission of stories from all communities and regions. 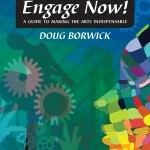 Please submit your entries, with attachments, to stories@artsengaged.com. The Robert E. Gard Foundation is collecting stories to help celebrate the upcoming 50th anniversary of “The Arts in the Small Community.” This book, which was revolutionary in its day, put forth key ideas: a) the vital role of arts in a democracy b) the linking of arts AND health, business, religion, youth issues, senior issues, cultural inclusiveness, and more and c) the creation of local arts agencies that meet broad local needs (such as economic development or environmental protection) as well as arts needs (such as exposure and audience-building). The book drew on the stories of 5 small towns as they developed local arts agencies.